Open Garden, a disruptive San Francisco startup that launched in May got our attention by allowing users of Macs, PCs and Android devices to create and share their own mesh network that uses the strongest connection between then whether its Wi-Fi, 3G or 4G. Now, the small six-person startup has raised a $2 million seed round to go after the opportunity. The new funding is led by Allan Green, an early investor in Phone.com and Mobileway; David Ulevitch, CEO of OpenDNS; Derek Parham, creator of Google Apps (s goog) for Business; and Digital Garage which also invested in Twitter and Path. Micha Benoliel, Open Garden co-founder and CEO told me that the money will be used to recruit more developers and add more features to the product. 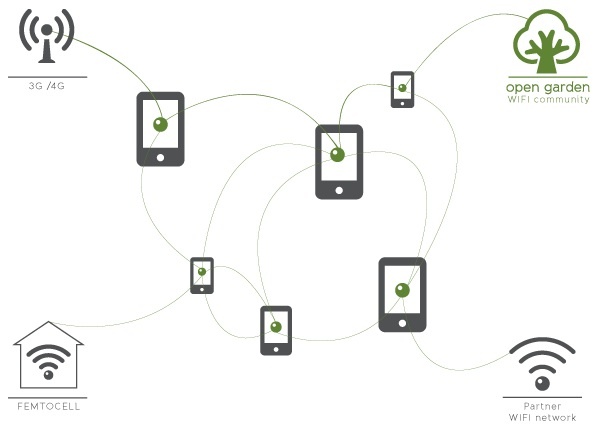 When users download the Open Garden application to their laptops and Android devices, they are able to rely on the strongest Internet connection between them to connect at the fastest speed. Users can also share their network with other Open Garden network connection with other users, allowing multiple devices to get a connection in a location, even if they’re not paying for local hotspot access or mobile broadband through a cellular carrier. The company has been working in recent months to improve the user experience and make the app run more seamlessly in the background. Open Garden is also working on implementing channel bonding so a device can use cellular and Wi-Fi simultaneously to improve performance. An iOS app (s aapl) was also planned by the end of this year but Benoliel said he’s still working on improving the Android experience first before devoting time to iOS. The service has had 250,000 downloads since it became available in June. But it’s gotten some early praise from big names like Union Square’s Fred Wilson, who said Open Garden was the startup that most impressed him from the TechCrunch Disrupt New York conference. Open Garden is intriguing because of the way it encourages people to share their connection and help more people get online. That allows users to get around some of the limitations of traditional gatekeepers, the carriers and Internet service providers. But Open Garden isn’t just trying to serve consumers. It is pitching itself to wireless carriers to help them improve their network performance and offload some of their traffic to Wi-Fi.